Daniel Frank Kelly was born in November 1886 in Sebastian, Victoria, Australia. The eldest child and son of Michael Kelly and Margaret Mary Mulvahill, Daniel was a hard working lad and was working as a Butcher at A W Brown Butcher Marong, Victoria, Australia, in 1913. He was also involved in the Hibernian Australian Catholic Benefit Society (HACBS) a church based support network that had been established by Irish immigrants. By 1914 as the clouds of world war one were rumbling in Europe, Daniel was living and working in Raywood, Bendigo, Victoria, Australia and Daniel was still working as a butcher. War broke out on the 28 July 1914,when Archduke Franz Ferdinand of the Austro-Hungarian Empire was assassinated in Sarajevo.The Austro-Hungarian Empire declared war on Serbia on 1 August 1914. 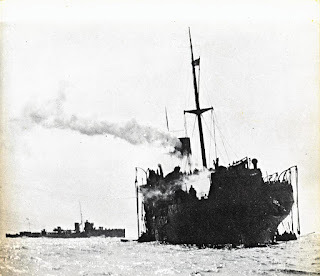 He didn't rush off for the 'adventure of a life time', he waited until the stories of great battles were being reported in the newspapers of the day and finally signed up on the 12 July 1915, 'The Great War' had been going at that time for nearly a year. He was 28 years & 9 months old, 5' 9" tall, fair complexion, blue eyes, auburn hair and 'clean shaven'. At that time he had been working for A W Brown Butcher Marong, Victoria for three years. He would have been considered an ideal candidate for the armed forces because of his 'stable' work history. 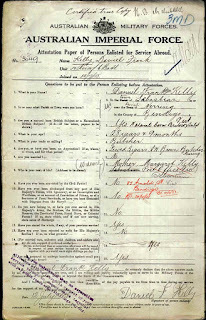 His service number was 3049 and he was assigned to Depot Coy 51, 6th Battalion Infantary AIF 10/6 Reinforcement, Firstly as a Private and then Lance Corporal on 4 August 1916 when he was serving in France. He proceeded to join the british expeditionary forces 26 March 1916 at Alexandria, then disembarked at Marsailles from the HMAT Ballarat. A Court of Enquiry was held on the 29 June 1917 where evidence was put forward to explain what had happened to Daniel Frank Kelly. 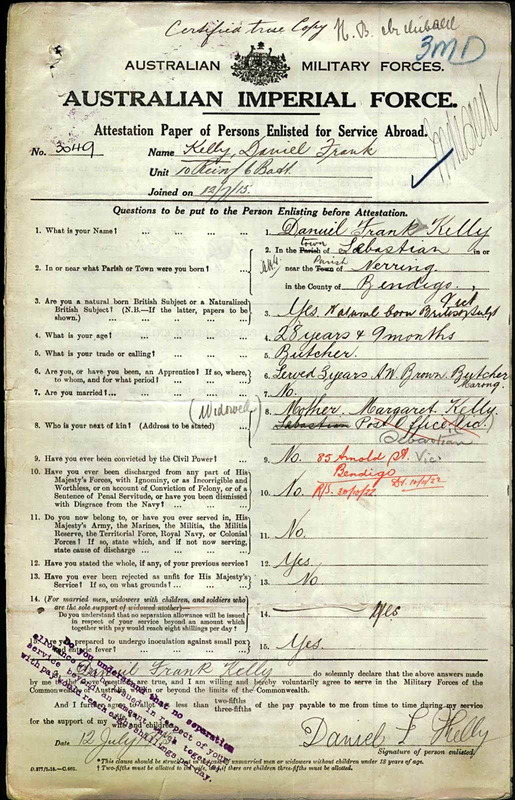 It was stated that Daniel had been killed 15th August 1916, cause of death, 'Killed in Action' Place of burial - 'Particulars not yet to hand'. Eventually details filtered back to Australia and Fr O'Carroll of Marong, through the Defence department and they were published. 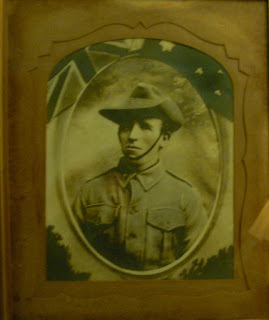 Daniel Frank Kelly 1886 - 15 August 1916. Ancestry.com, Public Member Trees (Provo, UT, USA, Ancestry.com Operations, Inc., 2006), www.ancestry.com.au, Database online. Record for Daniel Frank Kelly. http://search.ancestry.com/cgi-bin/sse.dll?db=pubmembertrees&h=190073392769&indiv=try. Ancestry.com, Australia Birth Index, 1788-1922 (Provo, UT, USA, Ancestry.com Operations, Inc., 2010), www.ancestry.com.au, Record for Daniel Kelly. 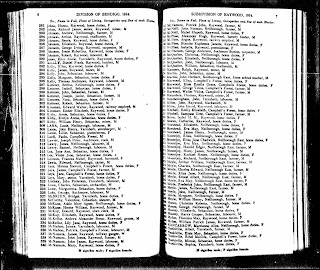 http://search.ancestry.com/cgi-bin/sse.dll?db=AusBirthIndex&h=644682&indiv=try. 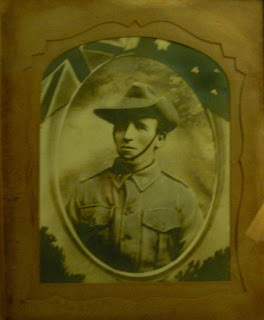 Ancestry.com, Australia, WWI Service Records, 1914-1920 (Provo, UT, USA, Ancestry.com Operations, Inc., 2015), Ancestry.com, Record for Daniel Frank Kelly. http://search.ancestry.com/cgi-bin/sse.dll?db=AUSWWIService&h=64177&indiv=try. 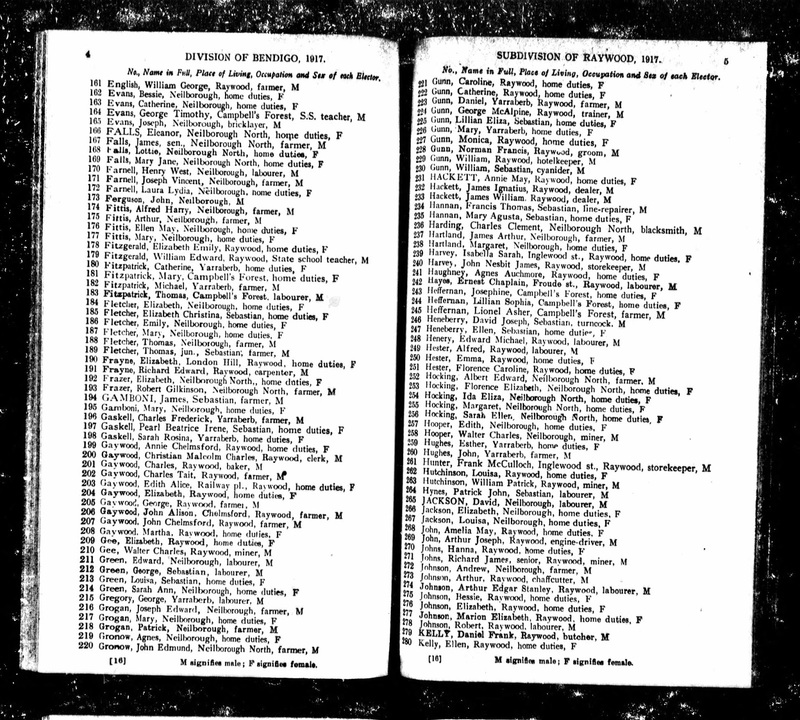 Ancestry.com, Australian Electoral Rolls, 1903-1954 (Provo, UT, USA, Ancestry.com Operations Inc, 2010), www.ancestry.com.au, Record for Daniel Frank Kelly. http://search.ancestry.com/cgi-bin/sse.dll?db=AUSelectoralrolls&h=9457244&indiv=try. 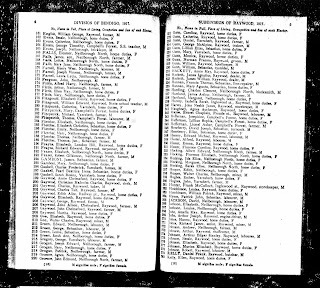 Ancestry.com, Australian Electoral Rolls, 1903-1954 (Provo, UT, USA, Ancestry.com Operations Inc, 2010), www.ancestry.com.au, Record for Daniel Frank Kelly. 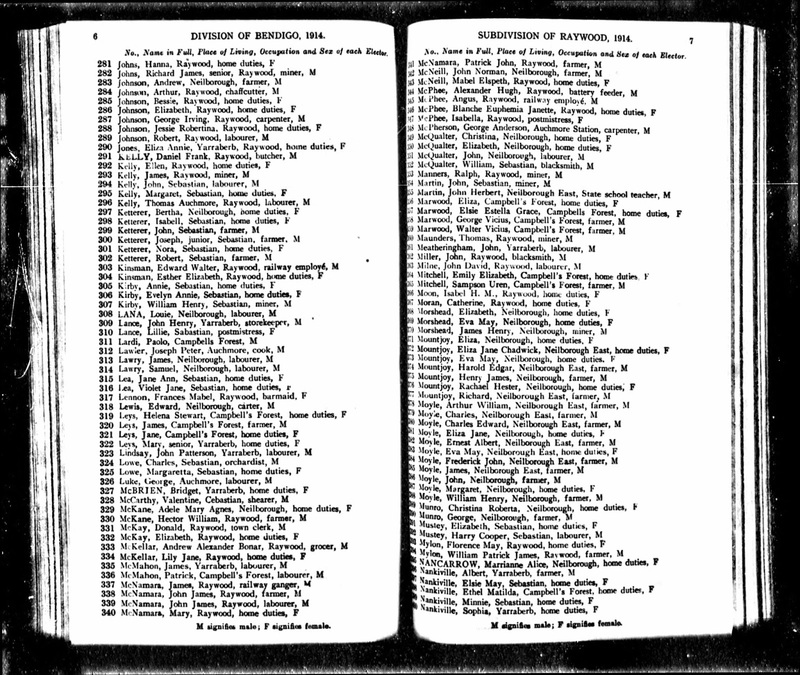 http://search.ancestry.com/cgi-bin/sse.dll?db=AUSelectoralrolls&h=168214086&indiv=try.